Ask any political junkie, and they'll tell you that the 2016 presidential campaign season has been one of the strangest they've ever experienced. The rise of billionaire/reality-TV star Donald Trump and Vermont Senator Bernie Sanders, the wild-and-woolly TV debates, and the Twitter wars and pundits being just flat-out wrong at predicting much of anything have been unprecedented in American history. Even things as predictable as the stock market didn't react to a Trump win the way millions of analysts had forecast. However, if we set aside the drama, we may discover that the most important thing we can learn from this election season has nothing to do with the candidates or the results. Instead, the key takeaways, in our view, are: (1) how the two megaforces of globalization and demographics have changed our country, and (2) the influence they will have on our national and global economies for years to come. It would be wise to pay attention to this. First, let's look at globalization. We've heard a lot of talk about trade, trade agreements and jobs, especially from the eventual winner, Donald Trump. However, unless you've been personally affected, much of it seems more abstract than real. So let's make it real. When we see that 31% of all automobile workers have lost their jobs since 2000, we can understand why Michigan and Ohio voters were angry, which ultimately decided the election. When we observe that 71% of all textile and apparel jobs have been lost, it's easy to relate to concerns voters in the Carolinas expressed at the ballot box. So globalization is a double-edged sword. Many individual companies and investors have benefited from rising stock prices tied to increased corporate sales and profits. But it has been devastating for a number of U.S. cities, workers and families. During this election cycle, we've heard the voices, and seen the pictures, of many of those affected individuals. For the first time, the Millennial generation (individuals between 18 and 43 years of age) will match up with the Baby Boomers (born between 1946 and 1964) in population size. As the Baby Boomer population decreases, the Millennials will take their place in history as the largest generation of Americans. What many don't understand is that we're just beginning to see what happens when the Millennials flex their cultural and political muscles. As consumers, Baby Boomers have been the dominant spenders for two decades and have spent more at every age than prior generations. They have thus driven the growth of industries such as personal electronics, recreation and healthcare. As investors, Baby Boomers have prospered from unprecedented stock and real estate market growth. As the value of their assets rose, their spending increased, and the generation's savings rate fell to all-time lows. Now, as they look ahead to the end of their careers, they will change the face of retirement in America. Like Baby Boomers, the Millennials will make their mark on the country by influencing our culture and economy. They have been particularly visible in their support of Democrat Sanders and his message. In the Michigan primary in early March, exit polling found that 81% of Democratic voters aged 18 to 29 cast their ballots for Sanders. In New Hampshire, 83% of Democratic voters chose him. inclined to marry later in life: 26% of Millennials between 18 and 33 are married, compared to 48% of individuals in that age range in 1980. These results shouldn't be surprising. This generation was shaped by the shock of 9/11 and the Great Recession. Yet, Millennials are more supportive on such issues as gay marriage and are more open to different ways of life than previous generations. This past election season, the Millennial generation made itself heard—and this is just the beginning. While we can't be sure where they will take us, we do know they will be a socioeconomic force for many years to come. 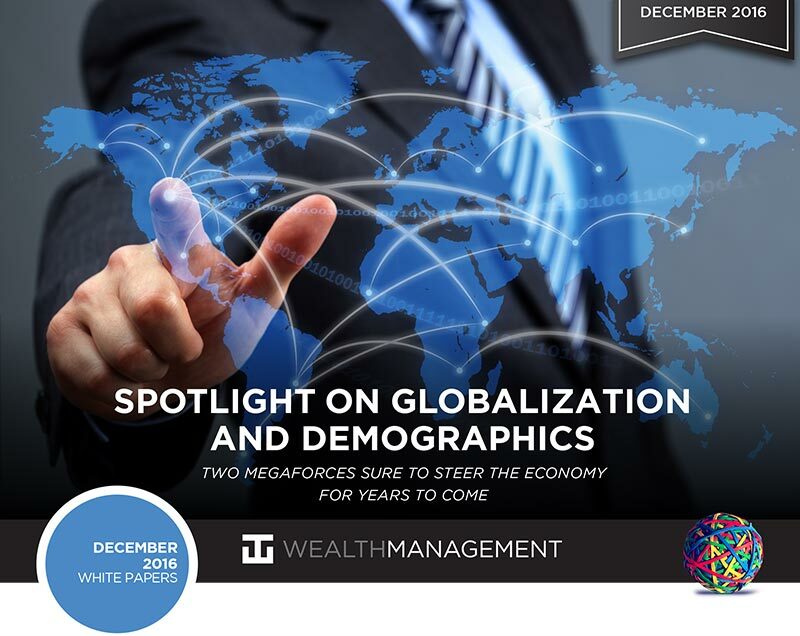 Globalization and demographics—two megaforces and hot topics this election—will continue to influence the markets in the future. WT Wealth Management's game plan? To continue to keep our eyes and ears open for sectors and companies that develop in the best ways, so we can help our clients capitalize upon these forces, invest accordingly, and grow their portfolios. WT Wealth Management is a manager of Separately Managed Accounts (SMA). Past performance is no indication of future performance. With SMA's, performance can vary widely from investor to investor as each portfolio is individually constructed and allocation weightings are determined based on economic and market conditions the day the funds are invested. In a SMA you own individual ETFs and as managers we have the freedom and flexibility to tailor the portfolio to address your personal risk tolerance and investment objectives – thus making your account “separate” and distinct from all others we potentially managed. WT Wealth Management is a registered investment adviser in Arizona, California, Nevada, New York and Washington with offices in Scottsdale, AZ Jackson, WY and Napa Valley, CA. WT Wealth Management may only transact business in those states in which it is registered, or qualifies for an exemption or exclusion from registration requirements. Individualized responses to persons that involve either the effecting of transaction in securities, or the rendering of personalized investment advice for compensation, will not be made without registration or exemption. WT Wealth Managements web site is limited to the dissemination of general information pertaining to its advisory services, together with access to additional investment-related information, publications, and links. Accordingly, the publication of WT Wealth Management web site on the Internet should not be construed by any consumer and/or prospective client as WT Wealth Management solicitation to effect, or attempt to effect transactions in securities, or the rendering of personalized investment advice for compensation, over the Internet. Any subsequent, direct communication by WT Wealth Management with a prospective client shall be conducted by a representative that is either registered or qualifies for an exemption or exclusion from registration in the state where the prospective client resides. For information pertaining to the registration status of WT Wealth Management, please contact the state securities regulators for those states in which WT Wealth Management maintains a registration filing. A copy of WT Wealth Management's current written disclosure statement discussing WT Wealth Management's business operations, services, and fees is available at the SEC's investment adviser public information website – www.adviserinfo.sec.gov or from WT Wealth Management upon written request. WT Wealth Management does not make any representations or warranties as to the accuracy, timeliness, suitability, completeness, or relevance of any information prepared by any unaffiliated third party, whether linked to WT Wealth Management's web site or incorporated herein, and takes no responsibility therefor. All such information is provided solely for convenience purposes only and all users thereof should be guided accordingly.